It’s not often when we get a second chance to revise past bad karma and even less often that second chances lead to pleasant outcomes. Perhaps this review marks one of those rare occasions in my life. It all started last winter when, on a cold dreary night, I attended a Faith Kleppinger live show at The Red Light Café and… well… let’s just say that my experience -- and my ensuing review -- were less than favorable. So, Brendan wisely asked Tracers (not me) to review Kleppinger’s new solo album, Asleep in the Well. But, as fate would have it, Tracers took a rather untimely spill, dislocated her elbow (ouch! ), and ended up in a Demerol haze for several weeks. Writing reviews was not exactly her first priority, so Brendan reluctantly handed the duty over to me. This circumstance had all the ingredients of a ruthless rip-job review. Needless to say, I procrastinated. I put the CD by my stereo and waited: wondering, worrying, avoiding. But, after a few cocktails one night, I buoyed myself for the inevitable slaughter… which didn’t really occur. Even at a first listen, I found Kleppinger’s CD to be much more inviting than her live performance, offering a soothing collection of accomplished melodies and fine guitar work. Away from the din of tinkling glasses and boisterous conversation at The Red Light Café, Kleppinger’s subtle, melancholy songwriting revealed its complexities. Her quiet guitar, often obscured in live performance mixes, presents itself as sometimes intricate and sometimes driving, when opened up and preserved in studio recording. Her style ranges from straight girl-guitar work on songs like Dare to slow electrified pieces like City Three (similar at times to Peter Buck on Country Feedback). One track, Frames, even hints at Lou Reed during the early Velvet Underground years. She also sprinkles soft piano here and there to break up and enhance the sound. Lyrically, Asleep in the Well is more sophisticated than I remembered from Kleppinger’s live performance. Though her words are sometimes obscure and vague, Kleppinger includes interesting observations and turns of phrase within many songs: “Dare I make mention of Descartes and horses” (from Dare) or “These dirty cities/ They come in threes” (from City Three). She certainly has the potential to write songs with meaningful, thoughtful lyrics inspired by both intellectual pursuits and urban experience. Only one track, Two Minute Warning, disappoints in its reversion to a level of neurotic, simplistic self-loathing that tires easily. Kleppinger’s lush guitar work is probably the greatest strength of the album, and its mahogany finish is enhanced by a series of duets between Kleppinger and Young Antiques vocalist Blake Rainey, adding further resonance to tracks like Double Negative and Runaround. Rainey’s voice complements Kleppinger’s instrumentation well, but unfortunately, the duets also point out the greatest weakness of the album. While her songwriting and guitar playing are solid and confident, Kleppinger’s voice is often tentative, airy, and even flat, indicating a lack of confidence in her singing. On most songs, she attempts a vocal gentility -- perhaps an octave too high or a style too esoteric -- that her voice may not be able to accommodate yet. 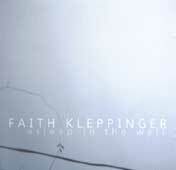 I am left hoping that Kleppinger’s future recordings have a harsher edge where she can explore a stronger, earthier vocal styling. Still, Asleep in the Well is a fine CD for rainy urban afternoons while reading a good book, creating a gentle mood perfect for background listening. Kleppinger’s melodies and guitar show great promise as a songwriter, and perhaps on her next release, her singing style will emerge to match those talents.